The Map is Not the Territory: Socks are Like Pants, Cats are Like Dogs, Really!! Socks are Like Pants, Cats are Like Dogs, Really!! Do you want your children and young students to feel like algebra is beautiful, playful, and intuitive? Come play, solve, talk, and make math with us! Support our book, reserve your copy, and make these math adventures available to children, parents, and teachers all over the world. 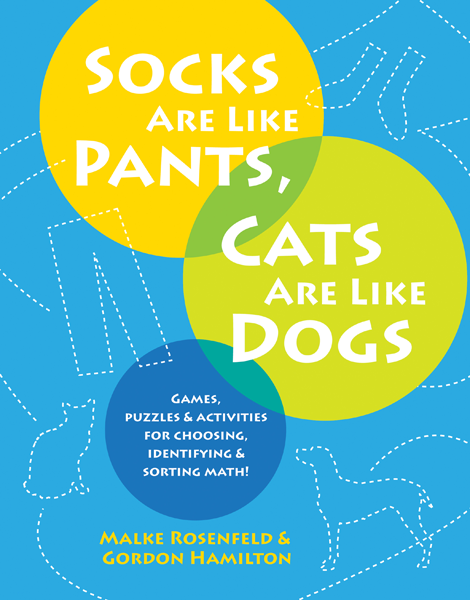 I've co-authored the book Socks are Like Pants, Cats are Like Dogs with Gordon Hamilton of Math Pickle. It's filled with a diverse collection of math games, puzzles, and activities exploring the mathematics of choosing, identifying and sorting. Teachers and parents have tested all activities in real classrooms and living rooms. The activities are easy to start and require little preparation. There's even a pdf of sample activities from the book for you to try! We’re almost done with our book; all that’s left is a few finishing touches. We’ve estimated the crowdfunding goal for this project to be $4,000. Any amount will help us reach our goal. Please help make this book a reality! Visit the crowdfunding site over at Natural Math for more images, and information about our project!